In this webinar, Dr. Chi Chao Chan presents the causes and treatments for AMD, as well as a model organism for human age-related macular degeneration (AMD). This novel discovery includes a double deficient mouse strain for therapeutic compound screening for human age-related macular degeneration (AMD). In this webinar, Dr. Chi Chao Chan presents the causes and treatments, as well as a model organism for human age-related macular degeneration (AMD). One Million Solutions in Health announces an opportunity to utilize science from the NIH which offers a novel mouse strain for therapeutic compound screening for human age-related macular degeneration (AMD). In this One Million Solutions in Health webinar entitled "NIH Special Science Series: Novel Mouse Strain for Therapeutic Compound Screening for Human Age-Related Macular Degeneration (AMD)" end users are provided with the opportunity to acquire knowledge about the latest science and technology directly from NIH scientists themselves. Users can also take part in One Million Solutions in Health's exclusive Signature Square process where they are able to assess the innovation, make inquiries and give open feedback to the scientists. Dr. Chi Chao Chan has developed a strain of mice as a model organism to research age-related macular degeneration (AMD). Currently, AMD is the most prevalent form of irreversible blindness worldwide in the elderly population. To discuss the cause of AMD, as well as treatments, a model organism is needed. She presents a model which been tested and proven to be successful. This novel discovery includes a double deficient mouse strain for therapeutic compound screening for human age-related macular degeneration (AMD). These mice develop focal retinal degeneration with early inception (4-6 weeks) and high penetrance (100% retinal lesions). The focal retinal lesions include photoreceptor and retinal pigment epithelial degeneration, a trademark of AMD pathology in the human macular arena. To understand the power and potential behind this technology, it is important to understand that universally AMD is the principal cause of irreversible central blindness in the elderly population. 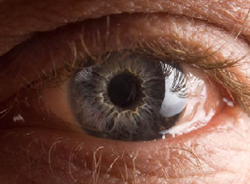 A study funded by the U.S. Centers for Disease Control and Prevention reveals that as many as 9.1 million people had age-related macular degeneration (AMD) in 2010, with this figure predicted to double by 2050. This innovative technology seeks to provide a model with high penetrance and early onset of human age-related macular degeneration. Presently, the exact mechanism of AMD is still under investigation and there is no distinct model for reviewing the full medical features of AMD. This model is already being used by Sanofi and Allergan for AMD testing, and can significantly contribute to healthcare by testing drug discovery and development processes of AMD. The Signature Square program includes organizations such as Pfizer, AbbVie, Amgen and Allergan, and many others.